Italian inspired One Pan Chicken Scarpariello is sweet, sour and tangy.. and might just become your weeknight bff! A simple dish of chicken, red peppers and sausage, it’s quick enough for weeknights but interesting enough for company! 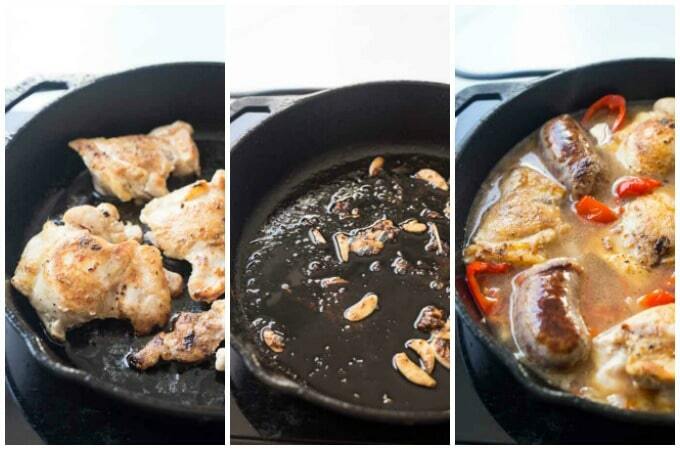 Chicken and Peppers – In One Pan! If you’ve been around the Table for a while, you know I’m a huge fan of one dish dinners. Simple, easy and made from pantry and fridge staples, recipes like this Moroccan Lemon and Olive chicken or this Hunter’s Stew are the ones I turn to again and again – and this Chicken Scarpariello recipe is my newest addition! Chicken: I used boneless thighs, but breasts and drumsticks would also work! Onions and red bell peppers: always a staple in my fridge! Italian Sausage: I used sweet but you could definitely use hot or mild. Hint: I break up packages of sausage and freeze them in 2 link bundles to add to soups, chiles, and pasta sauces. 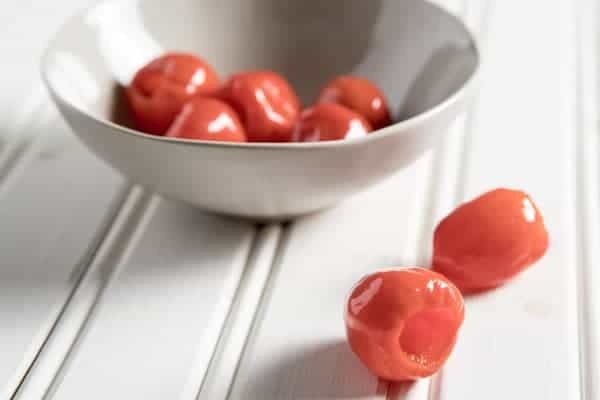 Peppadew peppers: sweet, pickled peppers, you can generally find these in with the pickles at your local grocery store or you can order them online! Dry white wine: You can definitely omit this if you don’t consume alcohol. Good Chicken Broth: Use your favorite brand or homemade! Where did Chicken Scarpariello come from? Like so many dishes, no one exactly knows for sure. Some believe this chicken with peppers recipe originated in New York – others claim it’s from southern Italy. “Scarpariello” means shoemaker or shoe fixer – the story goes that because both husband and wife typically worked to make the shoes, there was little time to make dinner and so meals were made from whatever was quick and handy – sounds familiar, doesn’t it? 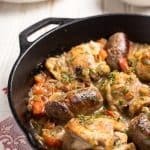 Personally, I’d like to thank whoever it was that came up with this chicken and italian sausage dish because it’s absolutely delicious and weeknight friendly! 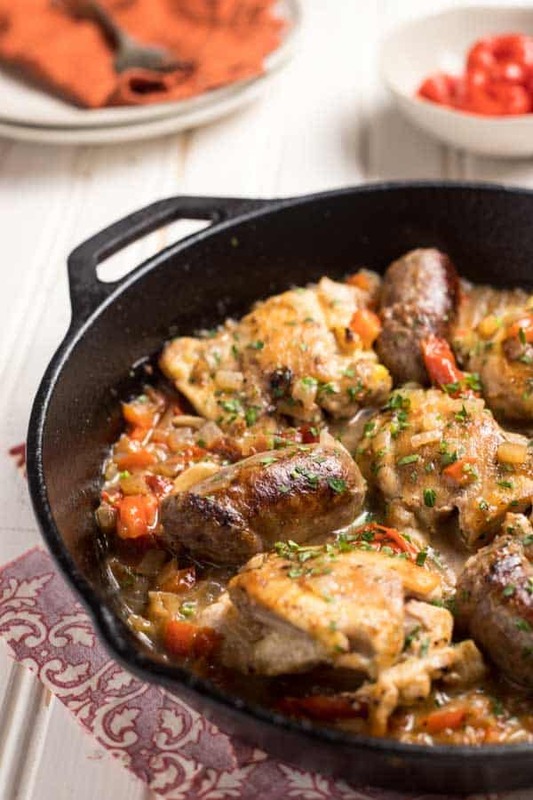 Can you freeze this chicken and sausage dish? You can easily freeze this recipe so make a double batch and put the other one in the freezer! In a heavy skillet (I recommend cast iron!) brown the sausages in a little olive oil. Remove and then add the chicken thighs. Remove the sausages and transfer to a plate. Add the chicken skin side down. HINT: for golden brown chicken skin, blot the chicken dry with paper towels before adding to the pan! Remove the chicken and add the garlic! Remove the chicken and add the garlic and brown it – but be careful not to burn it! Remove the garlic and set aside. Add the onions and bell peppers and cook, stirring, until golden. Add the wine and broth, scraping up the browned bits and let the sauce cook down for about 10 minutes. Add back the chicken and the sausage and serve! Sweet, sour and a bit tangy, this Italian inspired One Pan Chicken Scarpariello might just become your weeknight bff! Heat a large, heavy bottomed skillet over medium heat. Add the olive oil and heat until the oil begins to shimmer, about 2 minutes. Add the sausages and cook until nicely browned, about 3 minutes. Turn the sausages and cook for another 3 minutes. Remove from the pan. Add the garlic and saute 1 – 2 minutes until brown but not burned! Remove from the pan and reserve. Add the chicken and season with salt and pepper. Cook until browned on both sides, about 3 minutes per side. Remove from pan and reserve. Add the onions and bell peppers and saute for 2 – 3 minutes until the onions are translucent and beginning to turn golden. Add the wine, stock, garlic and rosemary, scraping up any browned bits. Increase the heat to high and boil until reduced by a third, about 6 – 8 minutes. Reduce the heat to medium andd the chicken, sausage and peppadew peppers back to the pan. Cook until the chicken reaches 165 degrees on an instant read thermometer, about 5 – 7 minutes. Garnish with parsley and serve with rice or roasted potatoes. You can buy jarred, pickled peppadew peppers for this recipe or search your markets olive bar where you can purchase a smaller amount! To get the best sear on chicken, blot the chicken dry with paper towels. To save time, you could mince the garlic and add it with the peppers and onions. I like to saute it separately for this dish since I believe it imparts more garlic flavor but if time is an issue, cooking it with the onions and peppers works great too! I hope you enjoy it Madonna!!! I like easy-to-make, one-pan meals, too. This one looks delicious. Great photos, by the way. Thanks.